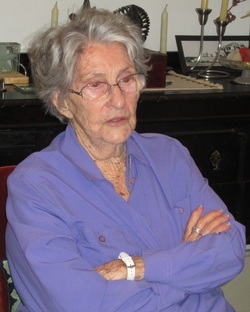 We were honoured this month to have Audrey Silver fill us in on the history of London Street. When she came to have a look around the area in the late 1940s, what is now London Street was fenced off and owned by Mr Freeney. He owned the big house on the lower corner of London Street and St Johns Avenue. He was amenable to a down payment of 12 pounds for an adjacent block and her husband built a small home for them overlooking the picturesque horseshoe bend of Enoggera Creek. She had a great love of the natural beauty and loved to walk through the tracks of the creek side bush land. To her dismay, people began clearing the trees she so treasured and carting away, for sale, truckloads of topsoil. Erosion became a problem. She became aware that parents bought air rifles and gave them to their sons as gifts and she grieved the decimation of bird life. With fire in her belly she became a force to be reckoned with as Ashgrove’s first conservationist. She met with state, council and army representatives to argue for the preservation of nature and was many times successful. People began to knock on her door asking her advice on how to save a particular tree under threat. We pay tribute to Audrey Silver, a pioneer of St Johns Wood. Thank you for going out on a limb to be a voice for nature at a time when many didn’t.